The road to a good monitoring and evaluation system is paved with a sound baseline survey. A survey is an integral part of effective data collection and analysis. While it might seem obvious that baseline information is necessary to understanding the cause and/or effect of any study or policy implementation, baseline surveys often don’t get the attention and effort they should, hindering the effectiveness of their subsequent studies and policy execution. The steps that go into creating an effective baseline survey require some legwork, essential to developing useful information that leads to greater success and understanding, in the long run, of the subject being studied. So let’s start from the beginning. What is a baseline survey? Simply put, it measures key conditions (indicators) before a project begins against which change and progress can be assessed. A baseline survey is the instrument that is used to record these measurements. Why are these measurements important? Because it’s very difficult to plan, monitor, and evaluate your performance without baseline data. It helps organizations set achievable and realistic targets for their results, since baseline data provides a clear starting point to benchmark progress against. Without something to measure new results against, it is difficult to assess results as positive, negative or otherwise. In order to create a usable and substantive baseline survey, here is a helpful “to-do” list that can help develop a great baseline survey. 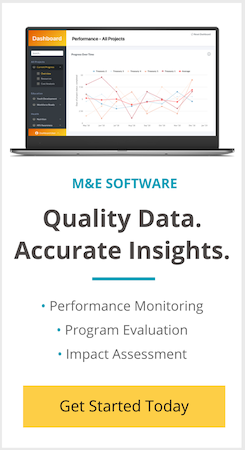 Do everything from conducting your baseline survey to daily monitoring and phase evaluation on one single software platform. Click here to learn more. What is the survey’s aim? Identify the purpose of the baseline study; the survey should be written based on the question you’re trying to answer or decision you’re trying to drive. Baseline survey questions and data need to directly correlate to the end goal or information desired. For example, let’s say you are tasked with starting a training program for English-language teachers who are teaching English to non-native speakers. There are theoretically a variety of ways in which you can assess the effectiveness of the training program: do the teachers express a greater understanding of teaching the English-language more thoroughly? Are there a greater number of students interested in taking the course? These are, technically, indicators of improvement; however it’s important to note that they are rather generic and could be influenced by a variety of unattributed factors. Narrowing down the scope of exactly what you are trying to measure will help significantly in defining the baseline survey/data. Test scores, for example, are one good indicator of an increase or lowering of a student’s understanding. Therefore, using student’s test scores to determine the effectiveness of teacher training offers a measurable–and re-measurable–standard for understanding what it is you are trying to study. In short, when designing a baseline study, figure out your question, figure out the data you need to answer that question, and then create the baseline survey to capture all that data. Prepare a budget and the resources needed to execute the baseline study. Determine everything that will be needed to execute the baseline study. Are there survey administrators that will need to be paid for their time? Is there a specific location that needs to be reserved for a study to take place? While a budget and resources generally fall in the category of basic logistics, accounting for them will allow the survey to be executed without any issue. For example, how many schools, teachers, and student test scores will be needed to accurately assess the English-teacher training at a baseline level? At what point is it best to execute a baseline survey — at the beginning of a school year immediately before or after teacher training, or at the end of the year after students have had a year of influence that could potentially alter baseline data? Answering these questions will help to create a useable baseline survey and might inadvertently help to highlight what is important for the survey’s central purpose (see point 1 above). The point of a baseline survey is to gather and/or analyze information from it. Determining how the data will be analyzed upon completion of the survey will help determine the resources necessary for the survey and can also help to determine the survey’s direction. For example, what sort of increase in student English test scores would suggest an improvement and teacher performance? Having a general idea of the trend the survey is looking to question, prove or highlight, will help guide the most useful questions of the baseline survey. Information is valuable only when it can be used, so be sure to consider exactly how you will use baseline data going forward. For example, by gathering baseline information about how well students are doing in an English-language class at the start of a school year and then collecting (non-baseline) data in the same format at various points throughout and at end of the year, it can be factually easy to tell how well students are learning and if there are gaps in the teaching process. If the expected improvement is not seen, how can baseline data in conjunction with follow-up studies show what is or isn’t working? All these points are valuable to consider and implement from a logistical perspective. At the same time, it’s important to also consider less tangible elements of baseline surveys that add to their long-term effectiveness. Ask baseline survey questions that can be tracked in the future in the same way, because baseline data is most useful when it can be compared to new data at a later date. For example, if you want to track the English knowledge of a class over a school year, you shouldn’t measure baseline knowledge with student scores on a test that’ll only happen once, say at the beginning of the year. Instead, it might be better to use something like the average weekly English test score, or scores on the quarterly English test, since those happen regularly and are directly comparable to one another. This way, data comparisons can be trusted to be accurate and encompass legitimate factual comparisons that results and analysis can be derived from. Don’t launch a baseline survey until you’re sure that it’s perfect. The best way to ensure that a baseline survey will collect the right data is through piloting. A pilot tests out all aspects of a survey — question flow, order, language, etc — before the survey goes live. Don’t make your baseline survey official until you’ve had a chance to assess what works for the survey and what’s decreasing the survey’s usability. This helps find questions that weren’t phrased well, or aren’t clear to your surveyors, or just won’t work in the context of the information sought to be collected. Read about the 11 things everyone should know while piloting a survey. Baseline survey data ideally has information that is valuable on its own. While this isn’t absolutely essential, really solid baseline data will have some sort of useable information, regardless of its comparison with data later down the line. A baseline data with this ability is not only substantiated as a valuable study, but also offers analysis and use beyond basic measurement, such as an information brief or rough program design (based on anticipated study outcomes). The proof of the pudding is in the eating. A robust baseline survey can be the link that mars or helps a monitoring and evaluation mechanism to deliver. I have been into research work, as research assistant, enumerator, field data collection. But i want to build capacity in other areas such as monitoring and evaluation, baseline reporting, research design etc. How do i go about it? can anyone tell me that baseline survey is a monitoring tool or evaluation tool? Its an evaluation tool since its the study planned at the beginning of the project to establish the current status. Then it is so because this is a stage where one needs to evaluate and see the difference from the starting point to where the project’s reached. I would rather say both, as in the beginning you need a baseline survey to build your foundation for what to do later; BUT, you are also going to use the same foundation to evaluate your work. You may use it to measure any changes in comparison to the situation as it was at the beginning, but you can measure the pace of your change in the society.